I figured my first post ought to be a doozy, and I think the above alone makes it so. 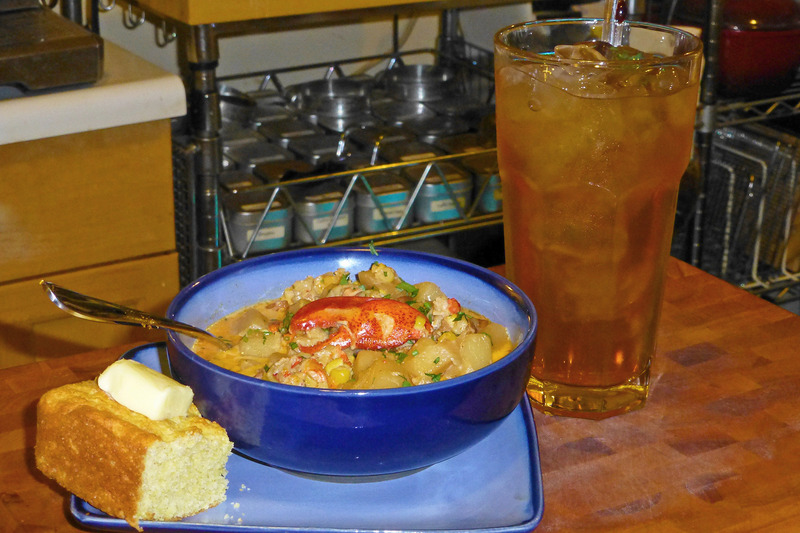 From last summer in my kitchen, this is Jasper White’s recipe for lobster and corn chowder. Chefs sometimes rhapsodise about their final meal. I’m not a chef, but I am a pretty good cook, and that chowder, some corn bread, and Luzianne sweet tea would be my choice. Generally speaking, Julia Child is my hero, but Jasper White is no slouch. The Finley Quality Network was the Bob & Ray radio comedy team’s fictional network, chief correspondent the slightly intrepid Wally Ballou, who never got his cues quite right. I shall do my best to emulate him. The reason for the blog? Well, a beloved corner of the interwebs I’ve been inhabiting for several years is closing down this week. It’s a warm, cosy place, with a lot of like-minded people, several of whom have expressed their appreciation of my posts in the few days since the dreaded but not wholly unexpected announcement was made. Though my posting has slowed in recent months due to an increased workload in the office, I will miss it dearly. I’ve written nearly 10,000 posts there and I’m not done speaking my mind, hence the result before you. This, then, is Mr. Science’s new basement lab. Welcome. This entry was posted in Introduction to the site. I always took a little look at your creations at the other place and enjoyed it immensely. Good to see you here. Love what you have done with the place, it already looks noice ! Look forward to having a good read when that little corner shop settles down. quietly in the corner and lurk. Fabulous! Can’t wait for more. I am looking forward to your future postings and wish you the best for this new venture. Thanks for this. Our once happy home is gone but it’s good to see there is more. PS—I love Bob & Ray. And I actually did win a diction award. Thanks for setting this up. Missing your posts was one of the things that I was really going to more miss about the other site going down. Well, I’ve found this here place.. I reckon.. So sad the circumstances that brought me and others to need to be here.. but well.. is it odd that upon hearing the news of the impending closure of, well.. you know, that the FIRST thing I thought of and lamented over was missing lalmon’s poasts? Glad to be here, this is definitely being added to my bookmarks! Yowser! Lalo strikes again! What a great idea! Would have really really missed communicatin’ with you and the gang! But here they all are! And here you are! Just fantastic! Life IS looking up! Oh and don’t we want to add Ricky Jay discussion in there somewhere? “Cards as Weapons” remains a classic. I’m going to agitate over on [site a] for the admins to migrate all [site b’s] [categories] posts to that location. Those three are completely empty right now.. blank… so maybe someone is ahead of me already? I hope so. Deb, apologies, but I removed the site details from your reply. I think it could be unwise to name them publicly. Ooo, yeah. I’ve been working my tail-feathers off and stressing from work and then to have our online community rumbled was too much and I went through a bit of a meltdown and lost all sense of caution. Thank you, all. Your comments mean a lot to me. I haven’t a mirror handy, but I’ll bet I’m blushing. Had I noticed the area to post comments earlier, I would have the day your blog started. Ooooo the corn is up ! Yesterday we stopped off at Hitsmans Farm and not five minutes later, in drove Mr. H with just picked corn on the back of his little tractor trailer. We got in line as there were already two other couples awaiting this bounty ! Oh and a good angus cow is a beautiful sight to behold. I am very certain I am not vegetarian as much as I like vegetables…my mother can go on and on about how straight a cows withers are…I only see pastrami, steak and fine hamburger possibilities…that along with bone marrow. When I look at a cows delicate little ankles. I appreciate their beauty ! I really do ! Is it similar for you Lalo ? Yes, I sing their braises praises at every opportunity! Pigs are quite fetching as well, so I just fetched a couple of full racks of baby back ribs for my birthday dinner tomorrow. Willard Farm corn, as fresh as yours if we’re lucky, and dauphinoise potatoes will accompany. Today is the actual day, but my best mate doesn’t arrive to festivate ’til early tomorrow, the start of my two days off. Happy B day Lalo ! Sounds like a thrilling dinner ! Wish we were all there to join you ! RIBS ! CORN ! What is for dessert Lalo ? Mine is the 16th so Ill be asking for similar fare ! My mom always tried (unsuccessfully) to make me a daffodil cake but in the high humidity of August weather never achieved lift off… So dessert will be a much simpler fare. We will be having something simple like a peach or a perfectly ripe plum. And even a plum can seal the deal I say. And pickles. First thing I did on arriving here was to put up a few jars of pickles. Just easy ones. thin sliced carrots and dried plums in vinegar with some spices. chinese cabbage with orange lemon and lime zeste and salt and vinegar…baby eggplants with dried sour plums… They’ll be so tasty in two weeks time ! That recently lost interweb was known to me as « the lalmon thread », so very pleased to see Mark Twain again. Loved the space and aviation posts and the news items you raised; the cooking photos just make me feel hungry, so I try to avoid them! Lalo you wouldn’t have that great recipe for meatloaf handy would you ? I’ve made one that kind of riffs on one you posted on said dearly departed site. But I’d love to have the real McCoy ! Mine had banana peppers in there for just a bit of bite. That and the rest of the baby kale because I didn’t know what else to do with it. Served it with pickled blueberries which are fast becoming my favorite favorite discovery of the summer ! Ladies and gents, I present the Real McCoy, just posted. Also, I added an option beneath comments so you can add an image to your reply.